IMAGE: Stefanopoulou numbers the cells while Siegel and colleagues measure voltages on the cells. They may not know about everything under the hood of Ford’s new Fusion hybrid electric vehicle, but U-M researchers enjoy an up-close look at what’s under the back seat. 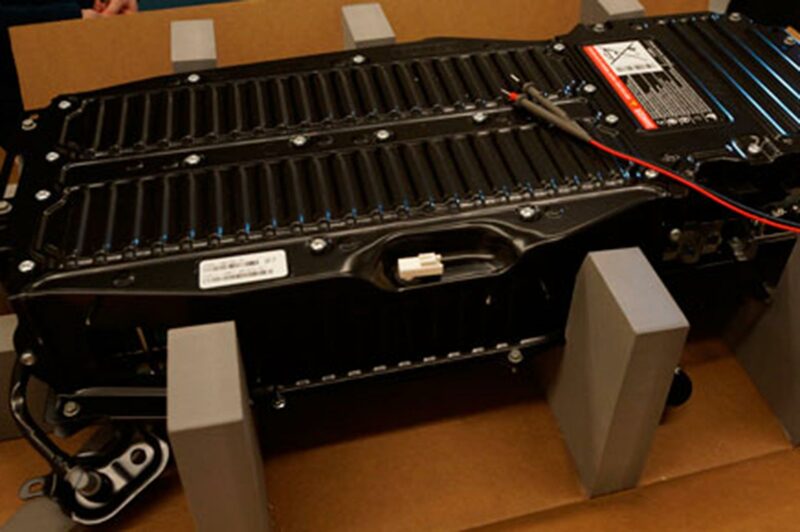 Ford has supplied one of its most advanced batteries to a team of electrical, mechanical and chemical engineers. In collaboration with Ford and General Electric, (GE) the team is beginning a project that will monitor the thermal and mechanical stresses on battery cells and develop a battery management scheme to reduce those stresses and prolong battery life. IMAGE: The complete battery pack in its steel case. 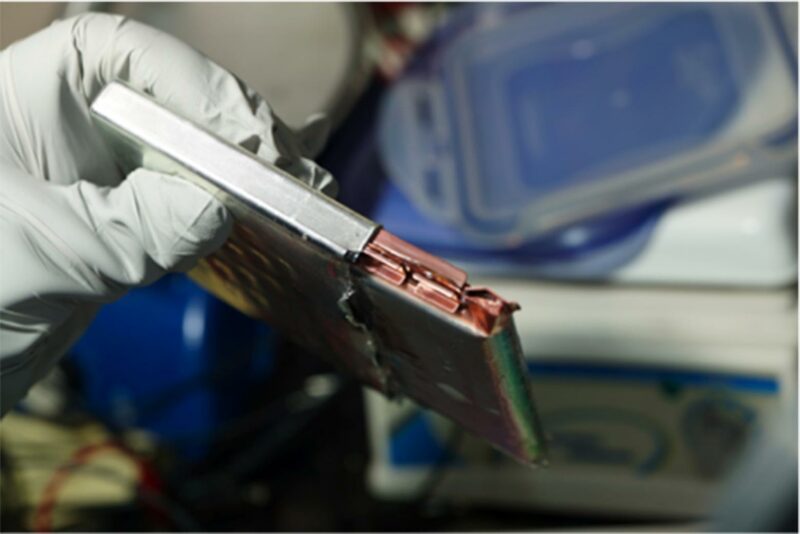 The project kicked off with the dissection of the battery pack, giving the team insights into today’s cutting-edge vehicle batteries from the “crash-worthy” steel casing to the cells. “It was a really fun day,” said professor of chemical engineering Charles Monroe. 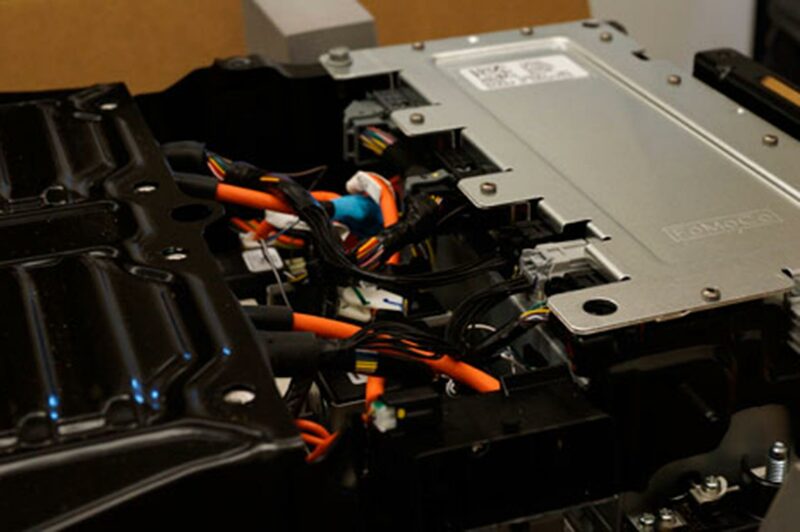 First, they removed the cover of the control module that monitors the voltages of the cells and connects the battery to the vehicle communication system. “This is as far as a dealer can go,” said Jason Siegel, a research scientist in mechanical engineering. Anything to do with the battery itself has to be done by Ford’s experts. IMAGE: The control module and a nest of wires is revealed. “This is as far as a dealer can go,” said Siegel. 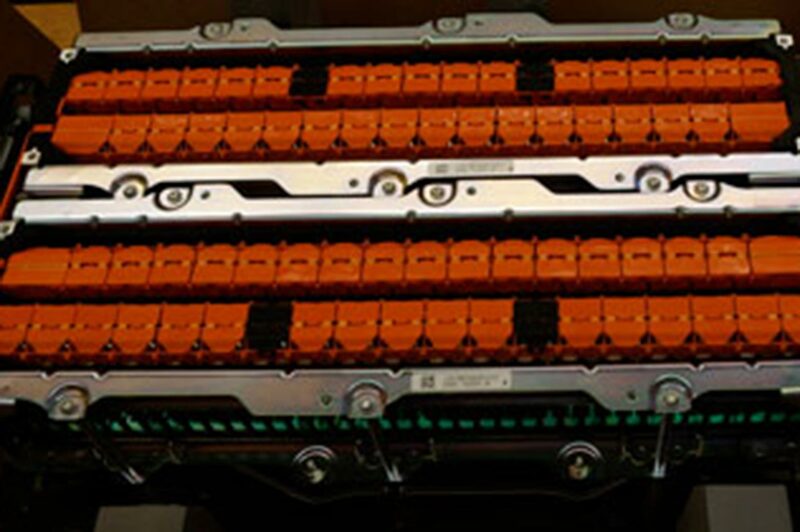 Once inside the tamper-resistant casing, they saw four rows of orange covers over the connections between the two 38-cell modules. The black covers indicate the breakers, which can divide the 300-Volt battery into six safer 50-Volt sections, for assembly and disassembly. The team then removed the connector covers from one side, revealing the tops of the cells and the black channel that runs down the center of the module. At the bottom of that channel, the batteries are designed with a weak spot, “like that thin little foil on a Capri Sun,” said Monroe. If a cell fails – due to overcharging, for example – and its pressure rises high enough to burst, it will break at the weak point so that the gasses will flow straight out of the pack and into a special exhaust vent. IMAGE: Four rows of orange connection covers, with black marking the breakers. The breakers can divide the 300 volt battery into six safer 50 volt batteries. 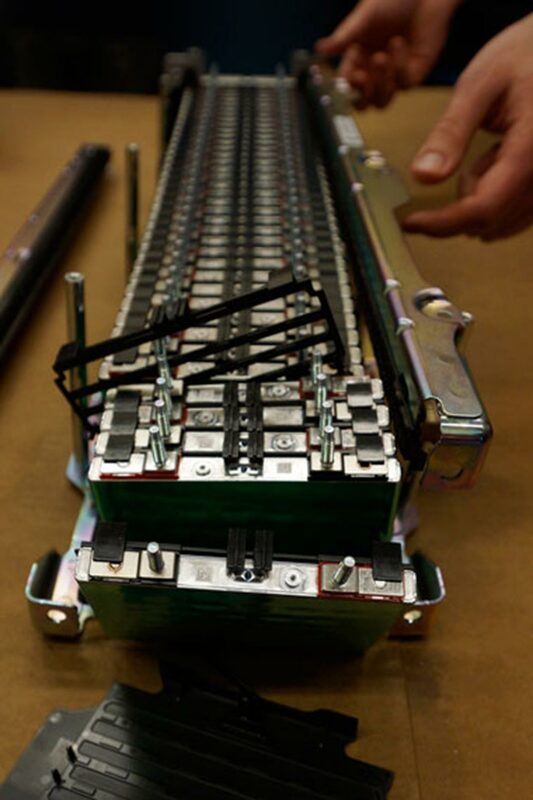 After removing all the connectors, they took off the end-plate on one of the two battery modules. “All these batteries basically shot out, so this thing is under significant compression when they run it,” said Monroe. That compression works a bit like a weightlifter’s belt. “As you put lithium atoms inside a carbon structure, the space expands, building up stress that can damage the cells as you charge them. Over many charge and discharge cycles, the cells swell and contract and eventually start to break down,” said Siegel. The tight squeeze keeps the batteries from expanding too much. Finally down to the cell level, the team has begun liberally applying sensors, provided by GE, under the translucent green electrical insulating film. For the heat maps, they will attach 48 tiny temperature sensors, just a fraction of a millimeter thick, to each side of a cell. IMAGE: Battery cells “shoot out” of the module. One of the spacers that allow air to flow between the cells sticks out. The black channel running down the center of the pack can safely carry gasses from burst cells into the exhaust vent. They sandwich the cell between two others to mimic the cell’s cooling environment and put the assembly into a combination oven-freezer in the Powertrain Control Systems Laboratory, led by Anna Stefanopoulou. “We can go up to Phoenix Desert conditions and all the way down to -40 degrees Celsius,” said Siegel. With the battery segment inside, Stefanopoulou and Siegel’s contingent will test straight charge-discharge cycles and also mimic the demands expected when the battery is installed in a real car, simulating the varying currents that the battery must supply or absorb. The group will run similar tests after rigging a cell up with strain sensors to see how the battery expands and contracts during charging and discharging. Meanwhile, Monroe’s group will investigate the battery’s materials and chemistry, clarifying what the temperature and strain data can say about what is happening within the cell. “This will require the development of new theory that accounts for the simultaneous transport of charge and heat within the battery cells,” said Monroe. 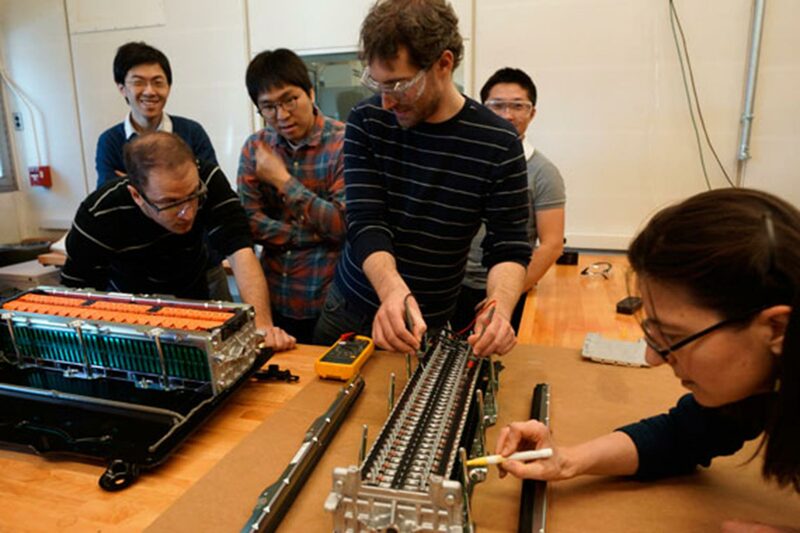 In the end, the battery team will develop computer models that predict how the battery will respond in various situations, determining what operating scenarios will result in large temperature fluctuations or mechanical strains that could shorten the battery’s life. Krishna Garikipati, professor of mechanical engineering and mathematics, and Bogdan Epureanu, professor of mechanical engineering, will lead the complex computer modeling effort. After the models have been proven against the data taken in Stefanopoulou and Siegel’s lab, the team will streamline them so that they are much faster but still accurate. “We’re trying to take this sensor data and use it for real-time, on-the-car battery management systems,” said Monroe. IMAGE: The layers within a cell. The team seeks to understand the basic mechanical and chemical properties of the cells in order to build an accurate model of the battery. 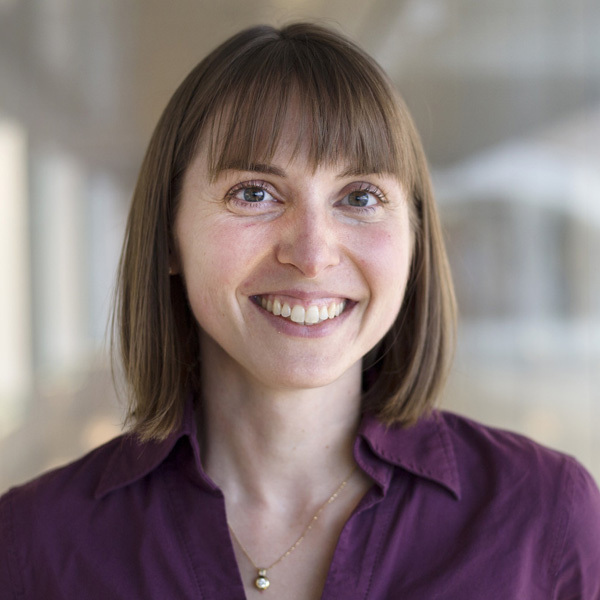 Stefanopoulou’s group will identify the critical measurement locations in the cells and across the pack for an economical and compact system. “Even tiny sensors can increase the cost and the packaging,” said Stefanopoulou. Siegel admits that if Ford’s design is as good as it looked when they took the battery apart, it will be tough to improve on it with sensors and software. If they succeed, a version of their method may one day be incorporated into the energy management systems of hybrid electric vehicles. But at the very least, their measurements will reveal how and where mechanical strains and heat build up in the battery – information that could improve the next generation design.